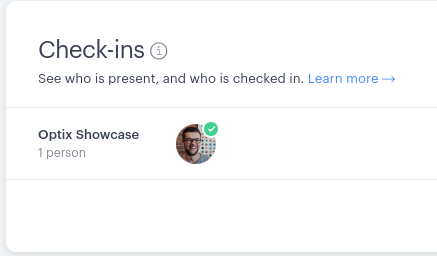 How are presence and check-ins related? Both presence and check-ins can help you understand who is present in your facility. While the two are related, they are not the same. Presence lets you know when a user is physically on site at one of your venues. Through a combination of a geofence placed around your venue and location services on the user's mobile device, Optix can identify when a user is present. This is indicated by an empty green dot on the user's avatar on the 'Check-ins' screen of your dashboard. Being shown as present does not deduct a day of user from a user's plan or charge them the day rate for using the facility. In order to do this, the user must be checked in. Users can check in by pressing the 'Check in' button on the home screen of the mobile app. 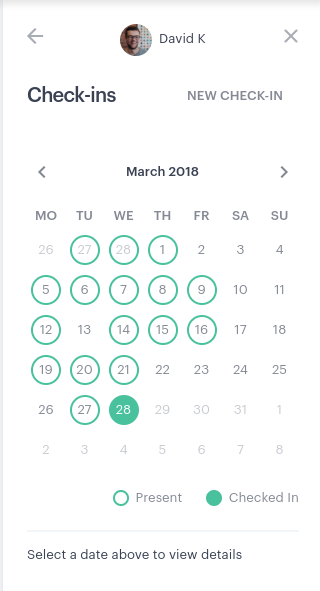 Doing so will create a check-in in Optix which either deducts a day of use from their plan or charges them your venue's day rate. The circle on the user's avatar will show a green check mark once the check-in has been created. Venue managers can also create a check-in on behalf of a user. The presence indicator is a helpful tool for identifying who has been on site but not yet completed the check-in process. Through the Users screen, you can also see historical presence data and create check-ins for dates in the past.